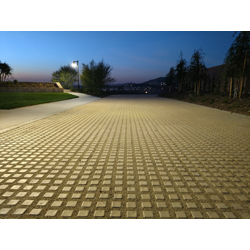 Drivable Grass is a permeable, flexible and plantable concrete paving system that is an environmentally friendly alternative to poured concrete and asphalt. It offers a reliable solution to storm water management through biofiltration, infiltration and storage while not sacrificing valuable site area. Applications include driveways, parking lots, fire lanes, access roads, bioswales, pathways, drainage channels and more.